William Chilton was a strident atheist who co-founded (with Charles Southwell) the atheist weekly, The Oracle of Reason: Or, Philosophy Vindicated, that ran from 1841 to 1843. In this paper, a forty-eight part series on evolution entitled “Theory of Regular Gradation” appeared. The first six parts were written by Southwell; but after his imprisonment on charges of blasphemy, Chilton authored the remainder of the series. Southwell, who had spent a portion of his career as a Shakespearean actor, employed theatrical rhetoric and peppered his articles with sensational claims, certain to make an impression on the public. In contrast, the articles written by Chilton, who in addition to writing for The Oracle, worked full-time as a compositor for the Bristol Mercury newspaper, are the result of his attempts to approach the subject from a more scholarly angle. Written by Chilton, parts VII through XLVIII of the “Theory of Regular Gradation” are an exposition of contemporary scientific research which he often had to lift from secondary sources. In Chilton’s first contribution to this series (Part VII), he makes the explicit claim that species transmutation – or, as he and Southwell termed it, the theory of regular gradation – “tends to the conclusion, that the inherent properties of “dull matter”… are good and sufficient to produce all the varied, complicated, and beautiful phenomena of the universe…”. Consequently, Chilton saw the development of thinking, feeling, sensing, and perception as purely evolutionary; and attributed to matter the “all sufficiency to produce the results attributed to intelligence.” (Part VIII). Having made the philosophical claim that a science of progressive evolution would inevitably lead to materialism, Chilton’s project was to convince his readers that mainstream science corroborated a theory of regular gradation in the organic world. To do this he first presented arguments for regular gradation in the inorganic world. Citing John Herschel’s Astronomy and Chamber’s Information, he argued that “The same force, power, principle, or forces, powers, or principles, or whatever it may be which, under certain circumstances, would produce worlds, may reasonably be imagined to people them afterwards with what we call organic forms” (Part X). Chilton then proceeded to explain how the peopling of the world with organic forms took place according to the sciences of geology and comparative anatomy. Using sources such as De La Beche’s A Geological Manual, he painstakingly recorded each of the fossilized organisms reported by geologists to have been “…found in the different geological strata of the earth, and showed, that not only were simple forms associated with more complex ones, but that the simplest forms of animals were contemporaneous with the lowest, or earliest strata, and that, as we proceed upwards from the granites to the tertiary, the number of complex forms increase, until at last, upon the tertiary strata, we find man…” (Part XLVII). Chilton drew particular support for “regular gradation” from the fact “that in no one instance in the petrified world are superior organisms…found unconnected with inferior ones…” (Part XVI). In the realm of comparative anatomy, Chilton took pains to dissect Cuvier and Grant’s animal classifications, which he believed would allow his readers to see the “beautifully progressive development of organization.” Drawing on Owen’s Cyclopaedia of Anatomy and Physiology, he described each of the structures and body systems homologous among animals of the same classificatory grouping in the hopes that this would “show the reader the points of analogy between himself and other animals” (Part XXIV) and help him to “re-assert the superior probability of the theory of regular gradation, or of the transmutation of species, over the asserted absolute creation of all…” (Part XLVI). 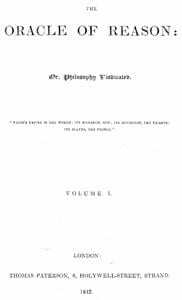 Although the “Theory of Regular Gradation” article series became less popular as it became more pedantic, ultimately contributing to the financial ruin of the short-lived Oracle of Reason, it is highly interesting today for what it reveals about working class access to and use of scientific theories of evolution in Victorian England. Chilton’s reaction to the appearance in 1844 of the Edinburgh publisher Robert Chambers’ anonymously published Vestiges of the Natural History of Creation is important in this respect. Neither Chilton nor Chambers were practicing natural historians. Rather, they culled their information from the broad scientific literature of the period and reworked it into a general system of evolution or transmutation. “The Theory of Regular Gradation” stands in contrast with Vestiges by virtue of its strictly materialist point of view and overt atheism (Chambers assumed a higher being that set the laws of the universe in motion), in addition to its containing some of the crude racist and anti-Semitic overtones of the day. To learn more about Southwell, Chilton and the politics of atheism and evolutionism of this period, please read Adrian Desmond’s Artisan Resistance and Evolution in Britain, 1819 – 1848; as well as pages 308 – 320 of Victorian Sensation, by James A. Secord (2000).